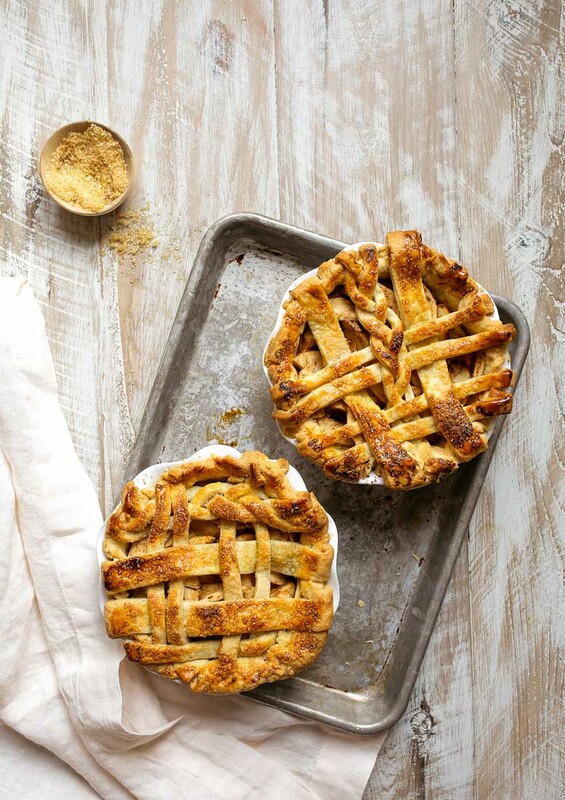 Mini apples pies baked in 6″ pie pans make the cutest apple pie for two. I was walking around Crate & Barrel the other day, hoping to trade all of my money for all the pretty dishes, and I stumbled upon two mini pie dishes. They were 6″ across, which is the size I use for all of my small pies, and the edges were fluted. Plus, they’re perfectly white. It’s so hard for me to find white baking dishes (I realize my life is sounding like such a struggle right now). I snatched up two mini pie dishes, skipped to the register, and headed home to peel apples. These pie plates were always meant to be mini apple pies. I learned a lot about apples as I put my mini pie dishes to the test. I started with a random bag of apples labeled ‘local’ from the farmer’s market. When those apples emerged crispy from the oven, I started googling ‘best apples to use in apple pie.’ I learned so much. If we were baking regular sized pies, there would be more wiggle room when choosing apple varieties, I think. But, since we’re baking mini pies with a lesser amount of crust that browns faster in the oven, we really have to make sure the apples are going to soften in our 30 minute bake time. For that reason, I’m only recommending a mix of Golden Delicious and Braeburn apples for making these mini apple pies. 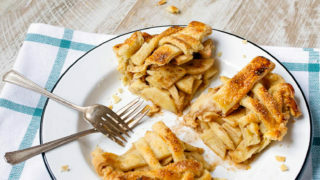 This article by Serious Eats that ranks apples for pie is my new favorite food geek article. I feel like we’re going to end the year with lots of pie recipes, is this okay with you? 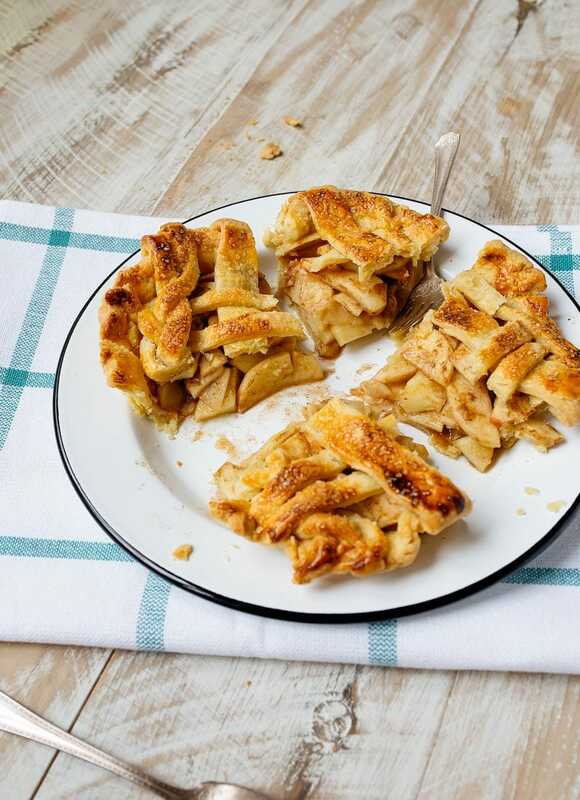 Each 6″ mini pie plate makes 4 mini slices of pie. Personally, I can eat two mini slices at a time, which is like 1 normal size piece, except with double the amount of crust (which feels like a total bonus!). 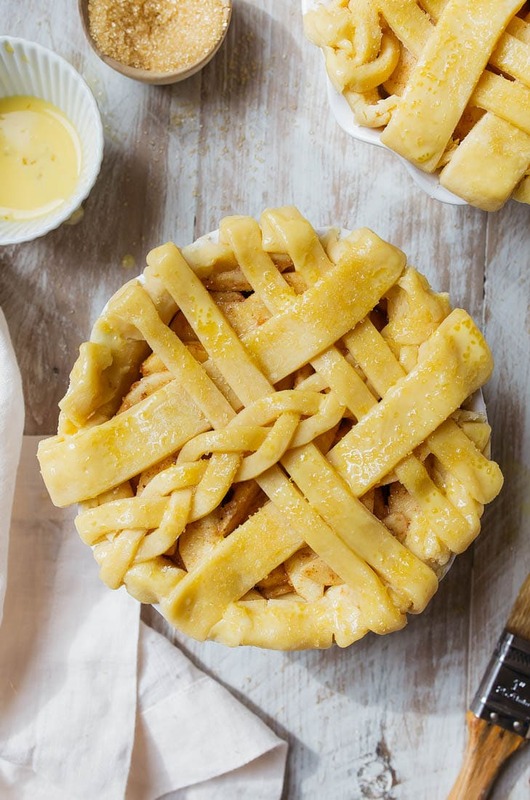 If you’re really a household of two, I suggest freezing the other pie for your next apple pie craving (unbaked, of course). If I had a mini pie waiting for me in my freezer at all times, I think I would probably be one notch happier. But, I guess we’ll never know because my family finished these two mini pies in a day and a half. I have a whole collection of apple desserts for two on this site, but my absolute favorite (after this recipe for mini apple pies, of course) is my crockpot apple butter. Two mini 6" apple pies for two. First, make the crust: dice the shortening and butter into 1/2" cubes and place on a plate in the freezer for about 15 minutes. In a large bowl, combine the flour and salt, and whisk lightly to combine. Add the chilled shortening and butter to the flour mixture, and use two forks or a pastry blender to combine. Incorporate the fats into the flour until the pieces are slightly smaller than peas. Don't over mix. Evenly drizzle the ice water over the mixture in two batches, stirring gently to combine. The dough should start to clump together (but not seem overly wet), but there should be no dry patches of flour. Scrape the dough into a large ball, flatten into a disk, wrap in plastic wrap and refrigerate for at least 2 hours. When the dough only has about 30 minutes left of chill time, peel, core and slice the apples into 1/4" slices. Place the sliced apples in a bowl, and stir in the sugar, flour, lemon zest, lemon juice, and all of the spices. Set aside to rest while you roll out the dough. After the dough has chilled for 2 hours, lightly dust your counter with flour. Divide the dough into 4 pieces, leaving 2 slightly larger than the other two (these will be the bottom crusts). Roll out the two larger pieces of dough to about 9" in diameter to fit inside the 6" pie pans, leaving plenty draping over the edges for crimping and sealing. Drape the bottom crust in the pie plate, and set aside. Next, roll out the two smaller pieces of dough to about 8" in diameter, and using a pizza wheel, cut 10-11 strips of dough that are 1" wide. If you want to make a plain lattice, leave the dough strips as-is. If you'd like to braid the dough, cut 3 thin pieces of dough from 1" strips. If you want to alternate thin and thick pieces of dough, make the thin ones by cutting the 1" strips in half. When you're ready to lattice the top of the pies, pour the apples into the pie pans. Pack the apples in very tightly. Be sure to include the accumulated juice in the bottom of the bowl. Dice the remaining tablespoon of butter and spread it evenly on top of the apples. Drape the strips of dough on top of the apples in one direction. To make a lattice, alternate flipping pieces back to weave in a strip of dough in the other direction (it's pretty hard to describe how to do this using words--search for a how-to video on YouTube, k?). 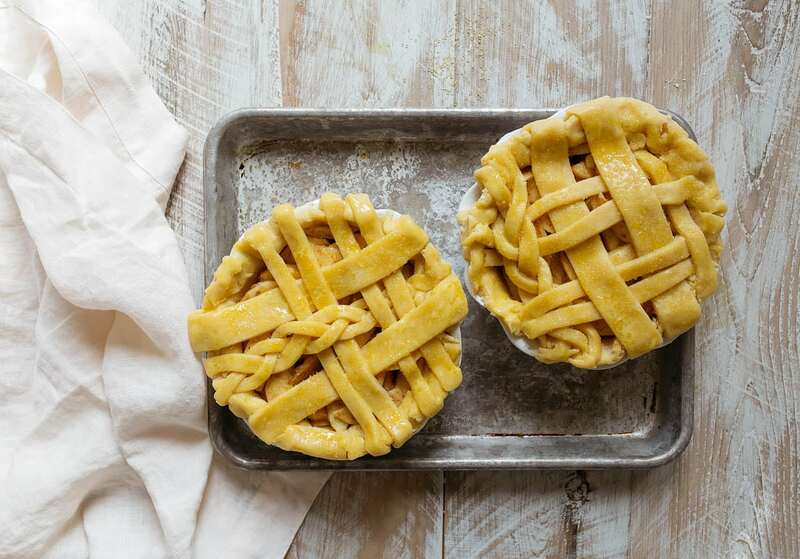 Once the top of pies are latticed, trim the excess dough from the edges, and pinch the bottom and top pie crust together. Use your fingers to crimp around the edges to seal in the apples completely. Finally, beat the egg yolk with a splash of water, and brush it over the surface of the pie crust. Sprinkle coarse sugar on top the pies. Place the pies on a baking sheet, and slide them into the oven. Bake them for ~30 minutes, and be sure to check to see if the crust is browning too much at around 20-25 minutes. If so, cover it loosely with foil to shield it from the heat of the oven. After 30 minutes of baking, use a knife to poke some apples and see if they're done. The pie is done when the apples are fork-tender, and the filling is bubbling, about 30-40 minutes (use a foil shield as much as you need to). Let the pies cool completely before attempting to slice and serve. I have C&B’s large 10-inch white pie dish with the fluted edges and absolutely LOVE it! It’s the only pie dish I use. But the 6″ ones seem perfect and great for freezing in smaller portions! Love this. Ok, I need the 10″ pan now!!! Yes, it is definitely OK with me to end the year with lots of pie recipes. I only have one 6″ pie plate, so I’ll probably make the whole recipe of pie crust dough but put half in the freezer for another time, and make half of the pie filling part to make just one pie. I love apple season! funny think is that I don’t like eating raw apples, as fruit. I mean I would eat them, don’t get me wrong but a plain appel would never be a fruit of choice for me…. 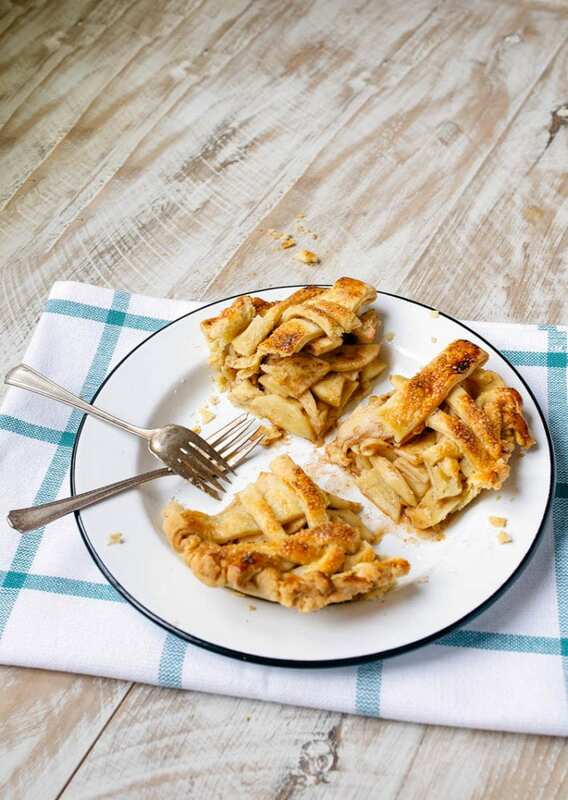 and then… give a cinnamont baked pie, apple cruble, apple pie, apple whatever you can thinkg of… and I’m all for it! Ooops, I apologize for such bad grammar! fast typping and auto corrector in my computer are not good friends at all! These apple pies are too cute. Just what I need in a household of 4 where only half of us will actually eat them haha. And I love pie in general, so yes!! Keep em comin! I never use shortening. Can I use all butter For the crust? First of all, these sound and look freaking awesome. I comment a lot with questions for your recipes (sorry! Probably a little annoying that I ask so many!) I don’t own mini pie pans. I found these when I was looking to buy some specifically to make this recipe. That’s how good it looks. Actually, all of my mini bakeware was bought to make your recipes. Do you think they would work okay even though they are silicone? It also says for graham cracker crust. Do you think I could use a ramekin for a pan as well? Thanks in advance! Sorry about the frequent questions! Side note: where did you buy your super cute mini whisk with the heart on it? I’m trying to find a mini whisk but I don’t know what size to get. Does 2×5 sound right? I’m looking on amazon. First, I haven’t tried silicone bakeware, but I hear really good things about it! If you use it, I would place it on a small baking sheet to hold it, just in case its’ a little wobbly. And yes, you can absolutely use a big ramekin. I use them all the time for pies, and love them! So, the heart whisk was a gift, but I have a Store on my site (see the Menu bar? Click ‘STORE’) and it links to another mini whisk that I use and love. Can i leave out the lemon zest? I only have lemon juice… I’ve been craving apple pie for a while! Happy Boxing Day. Your new Dessert for Two just arrived. Loving it! Thank you. Our favorite dessert is pie and we can’t have a lot of leftovers because DH who’s diabetic can’t resist them. I’m having a hard time finding the right pie plates. The only true seven inch ones I can find are on Amazon but aren’t supposed to be put in a pre-heated oven. Do you have any recommended sources, brands, etc.? Hi Louise! Thanks so much for writing! I have a store on my page with pie plates: pie plates for oven.